This fashion-forward goose is always changing her clothes and always making me laugh. But this ensemble tops anything I've ever seen before. I think Spring is here. Thanks to Patrick for the quick iPhone photo action! That's a question I'd also like to know the answer for! This pic is absolutely hilarious. And it took me a while to recognize the goose. Whoever did must have an very, very, very nice humor and is someone I'd like to call friend. Happy eastern or whatever you celebrate. Oh boy... that is just a little bit creepy looking, and awesome! LOL! 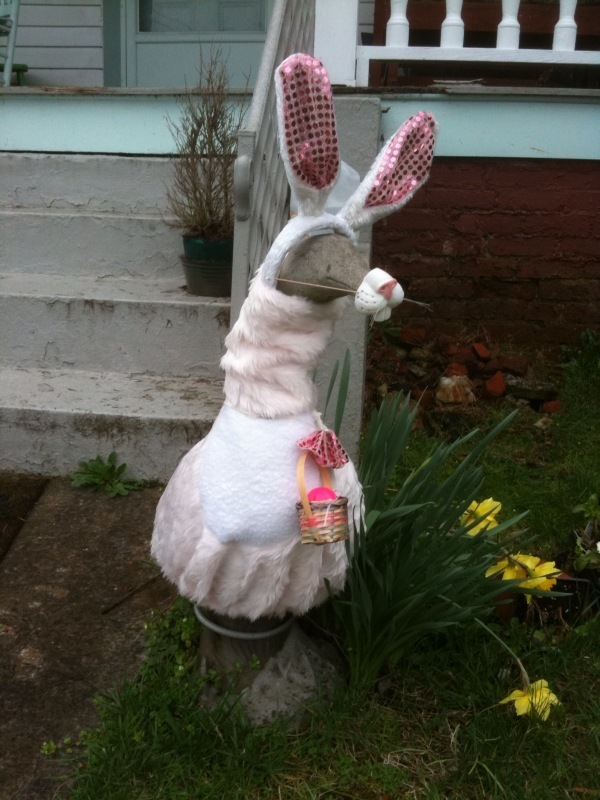 We've always thought those geese statues were tacky, but what a riot to dress one up for the different occasions!